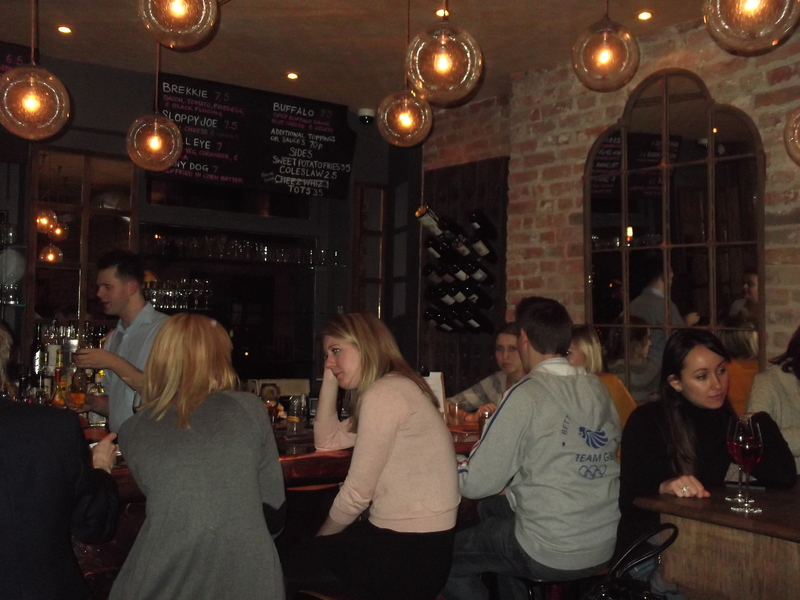 Bubbledogs is the hip restaurant of this autumn – many bloggers have already passed through its doors and in general it has received good write ups, see: doughnuts&swine and lisaeatsworld. 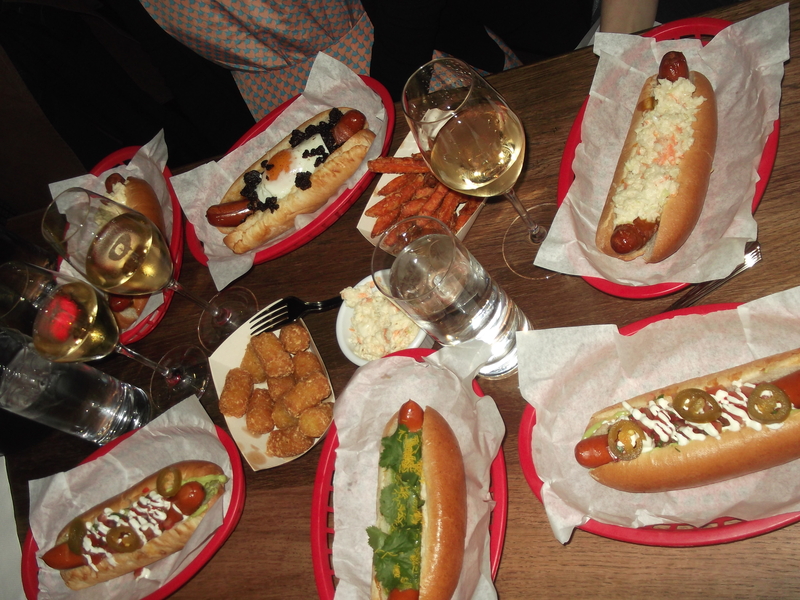 The concept of Bubbledogs is very simple – well sourced and affordable grower champagnes twinned with freshly made, well conceived gourmet hotdogs. Head chef James Knappett has a great pedigree, having learned his trade at one of the best restaurants in America, Thomas Keller’s Per Se and as Marcus Wareing’s right-hand man at the Berkley. However the food at Bubbledogs is very far removed from fine dining, although there is a chef’s table in the back of the restaurant that seats 19 and serves high end dishes. All the online buzz surrounding Bubbledogs has made it extremely popular and, given it only has 40 seats, demand far outstrips supply leading to massive queues. I went on a Thursday night, hoping to beat the crowds by arriving at 6pm, however it seemed like most of North London had the same idea because the line was already 30 people long when I joined it! We ended up waiting 2 hours and 10 minutes for a table which was pretty extreme (they accept bookings for tables of 6 or more so I recommend grouping together to beat the crowds). However, just as our blood sugar levels plummeted and our legs began to throb we were eventually led into the restaurant and to our table. The interior is bijou, with a few high tables and chairs and a longish bar with more seats along the window. The high seats aren’t very comfortable and may have been chosen to stop people lingering for too long at their table. There are 13 dogs on the menu (£6-8) and all are available in pork, beef and veggie – they aren’t huge and I think the average person could happily manage two. I opted for pork in all my dogs – the texture of the meat was good with nice fat content (although not too greasy), and there was a hint of paprika to add a bit of interest. The rolls had a nice crunch and weren’t too doughy, they did a good job of holding things together considering the multitude of toppings. 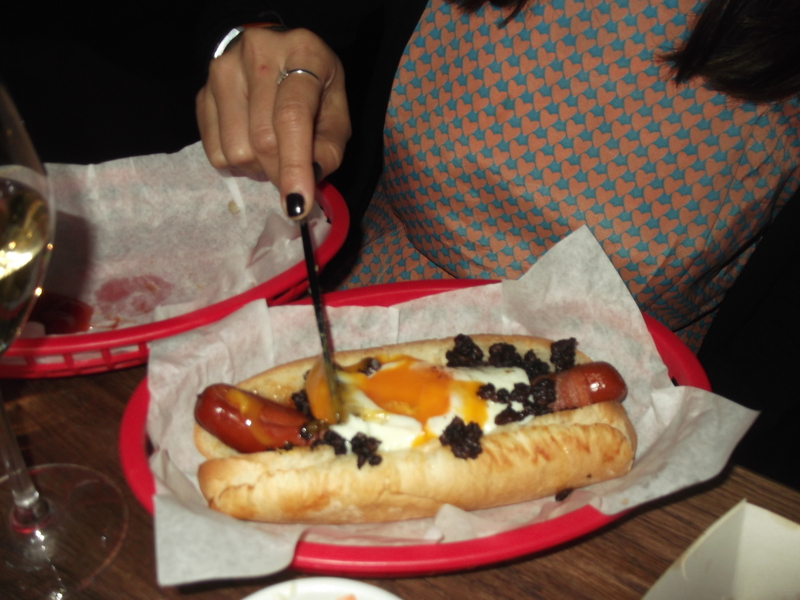 I sampled 3 hotdogs: my favourite was the 4th of July (£7) which was topped with fresh, creamy coleslaw and a tangy barbeque sauce. Trishna (£6.50) was very unusual combining fresh coriander, mint and mango chutney – the flavours worked very well together. 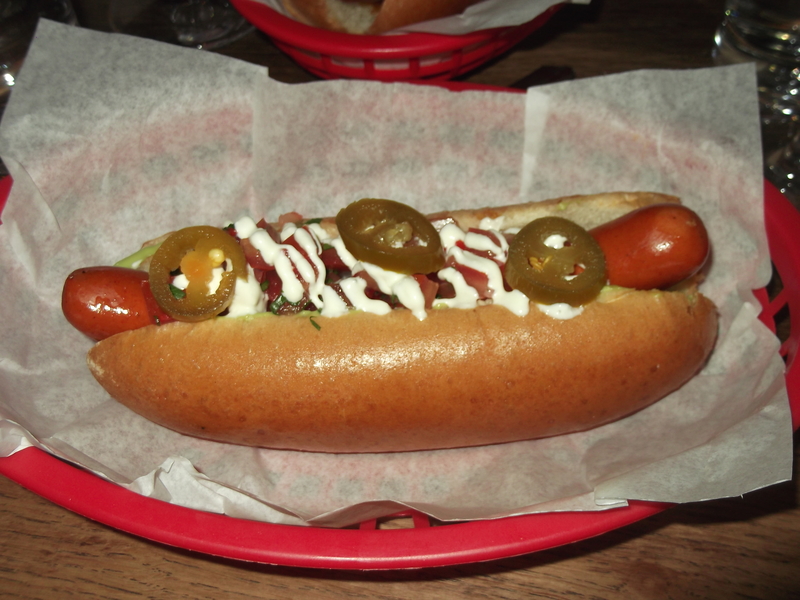 My least favourite dog was Jose (£7.50) which consisted of mayonnaise, jalapenos and avocado. The jalapenos lacked a bit of fire and looked like they had come straight out of a jar; the mayonnaise was unremarkable – it wasn’t freshly made but was a bit better than what you can buy in a supermarket. The champagne menu is, unsurprisingly, very long and I am sure those with a knowledge of champagne would be in their element. We just opted for the house champagne which was very reasonably priced at £32 a bottle: it was pretty uninteresting but certainly quaffable to an untrained palette like my own. Bubbledogs is very fun and it has a great buzz because it is currently the “in” place to be, but if you don’t like to queue I would advise visiting early next year once the bloggers have moved on. Categories: Hot Dogs | Permalink.